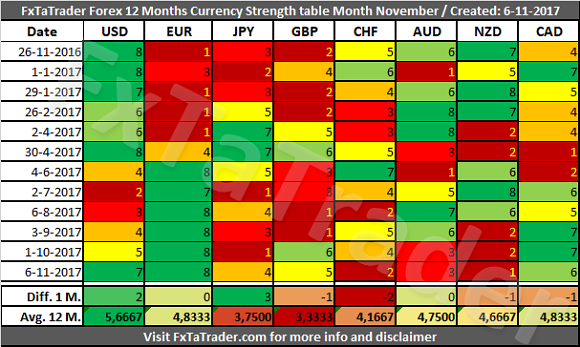 In the Currency Strength table, the EUR was the strongest currency again while the NZD was the weakest. There were some significant changes last month with the JPY gaining 3 points, the USD 2 points and the CHF losing 2 points. The other currencies remained around the same level of last month with a maximum change in the strength of just 1 point. The USD showed a very strong performance at the end of the month. The EUR showed a steady and strong performance during the whole month and to a lesser extent, the CAD did too. These currencies fit exactly with the current performance in the Classification and Score that they have. The AUD showed a very weak performance at the end of the month. The NZD showed a very weak performance during the whole month and to a lesser extent, the CHF did too. The CHF fits exactly with the current performance in the Classification and Score that it has. The AUD and NZD are Neutral currency and do not fit exactly with the current performance in the Classification and Score that they have. However, being Neutral currencies it may offer some good opportunities against the Strong currencies. Based on the development at the end of last month and the steady performance of the currencies during the last month as described above it seems that going long with the USD, EUR or CAD against the CHF, AUD and NZD may offer good opportunities. If this is being confirmed by the analysis in both of my Monthly articles and the charts are looking in the right direction, these combinations may offer good opportunities. When looking at the Average 12 M.. Score we can see the currencies grouped together according to their classification. 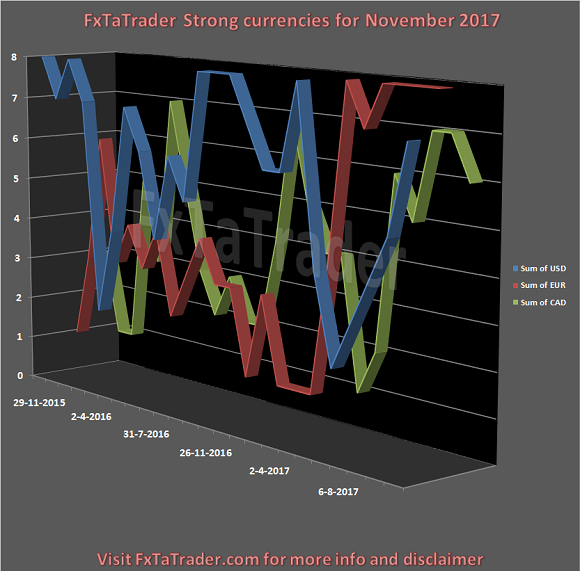 Strong - We can see that the USD, EUR and the CAD are clearly grouped together as Strong currencies around an Average 12 M. Score of 5 to 6. The EUR is the strongest currency and continues to deliver high Scores while the AUD, being a Strong currency, is showing a bit of weakness in the last 2 months. Neutral - The AUD and NZD are grouped together around an Average 13 wks. Score of 4,7. These currencies are very close to the Strong currencies and this means that they can easily change Classification in the coming period. Weak - The GBP, JPY and CHF are grouped together around an Average 13 wks. Score of 3 to 4. The GBP continues to show a lot of strength a score of 5 but lost a lot of strength in the previous months. It remains the weakest currency of all based on the Average 12 M. Score. This month we take a look at the Strong currencies. 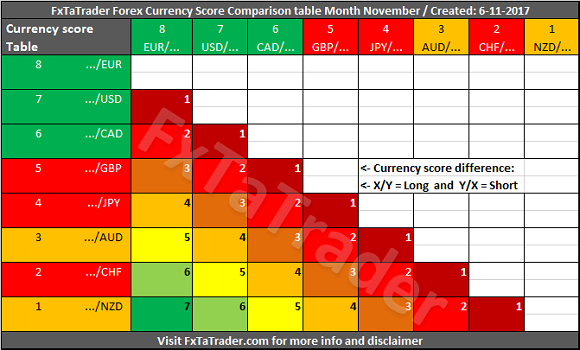 There were a lot of Classification changes and the Strong currencies for this month are the USD, EUR and CAD. As can be seen, the EUR came from the bottom a few months ago and is delivering very high Scores in the last 6 months. The USD and CAD made a dip around June of this year and both recovered. Neutral: EUR, CAD, CHF. The preferred range is from 3 to 5. Weak: JPY, GBP. The preferred range is 1 to 2. Strong: USD, EUR, CAD. The preferred range is from 6 to 8. Neutral: AUD, NZD. The preferred range is from 4 to 5. Weak: JPY, GBP, CHF. The preferred range is 1 to 3. Currencies with a high deviation seem less interesting to trade because they are less predictable. There are none for this month.